Naughty Monkey Just Smoked A Ton Of Weed And Got Extremely High. Everyone has their own special talents, even you and you and you...! Mine is being naughty. Despite what you may have heard from anti-science political talking heads, it is not a choice. Naughty Monkeys are born this way. We know monkeys are considered the most naughty animals in the animal kingdom. We have noticed apes’ behave that is the same of humans. Take for example this little monkey who just found out the wonder of weed. People smoke that this ape imitates. 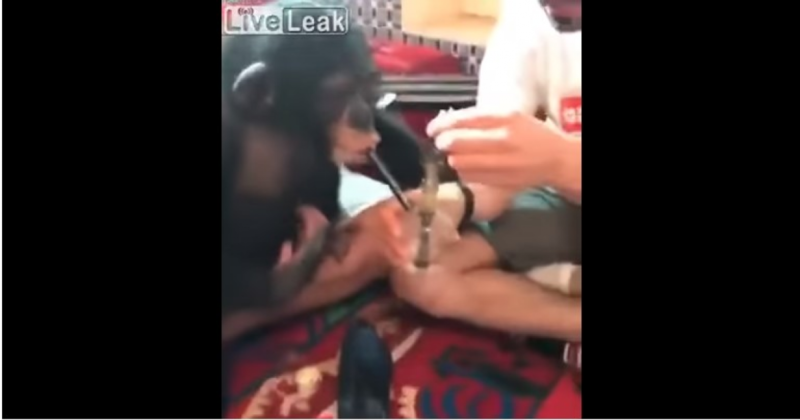 Here in this video you can see the monkey is smoking. The little moneky, wearing a diaper, taking a big hit from a bong. What’s even more amazing is that this little thing appears to be quite experienced with the MJ!